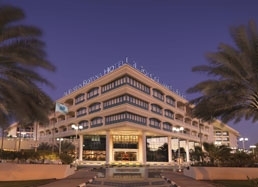 Al Bustan Rotana in Dubai is a luxurious newly-renovated 5-star hotel one of the leading hotels in the world. It boasts a unique combination of traditional Arabian hospitality and modern luxury and it is an ideal choice for the most demanding business and leisure travellers. Al Bustan Rotana is conveniently located near the Dubai Creek Golf and Yacht Club, Wonderland Theme Park, City Centre Shopping Mall and Festival City. It is also hust a few minutes away from Dubai International Airport and the World Trade Centre and Exhibition Halls.